Description from GoodReads: It’s a good day for sailing. Finn lives by the sea and the sea lives by him. Every time he looks out his window it’s a constant reminder of the stories his grandfather told him about the place where the ocean meets the sky. Where whales and jellyfish soar and birds and castles float. Finn’s grandfather is gone now but Finn knows the perfect way to honor him. He’ll build his own ship and sail out to find this magical place himself! And when he arrives, maybe, just maybe, he’ll find something he didn’t know he was looking for. I am excited to welcome Eric and Terry Fan to Kid Lit Frenzy. Thank you for stopping by and talking about your new book OCEAN MEETS SKY. Kid Lit Frenzy: I am curious about your collaborative process. As I looked at the illustrations, I kept wondering how you merge your individual styles into page spreads that work together so beautifully. Do you storyboard it first and then divide up the spreads or do you work on them together? And what happens when might not agree on something? Eric: We definitely always storyboard our art and do a rough dummy before proceeding to finals, so we have a pretty good idea of the basic composition and elements. Sometimes the image can change quite a bit as we move from rough to final because we like to give ourselves the creative headroom to allow new ideas to grow instead of being to chained to the rough. In any case, for the finals we’ll either work together on a spread if we’re in the studio together, or we’ll work on different parts of it and then bring the elements together in Photoshop and share the layered file in Dropbox. Terry: It’s nice to hear that our individual elements merge well, since that’s always our ultimate goal. It’s a fairly intuitive process and we’ve developed a good dialogue between us, and sense of how we want the image to develop, so we don’t run into too many disagreements. Our primary medium is still graphite or ballpoint. We scan the monochrome drawing and then colour it in Photoshop. Again, it’s a collaborative process and we can always count on the great feedback from our editor and art director to help steer us in the right direction if we’re unsure about something. KLF: Do you have a favorite spread in the book? And why? 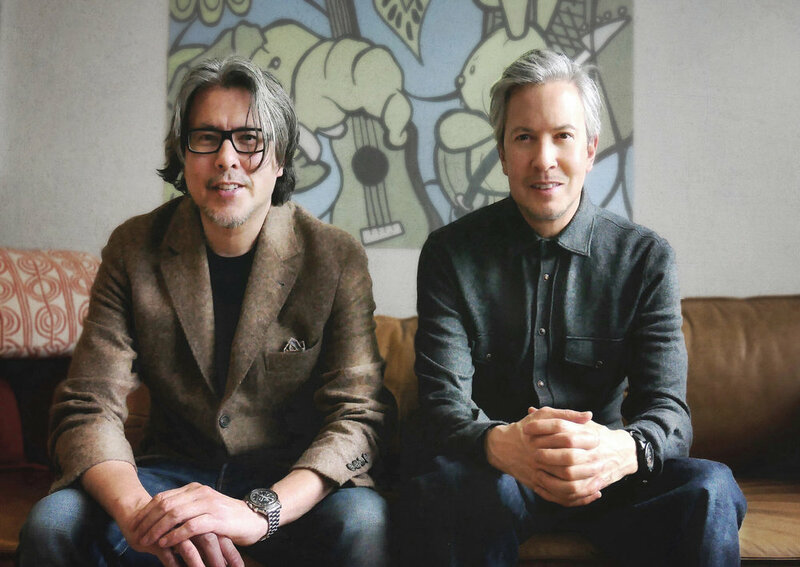 Eric & Terry: It’s really hard to pick a favourite spread from a book, but maybe the Library Islands spread, just because we knew going in that it was going to be a difficult illustration to execute, so there was a certain degree of relief when we finished it, which marked a turning point in the process where you feel like you’ve cleared a difficult hurdle. We also love books, and we had a lot of fun including books that have had an impact on both of us growing up, as well as inventing book titles as a shout out to friends and family. We completed the illustration during our Sendak Fellowship, and so we named one of the books “The Four Fellows” as a tribute to the two other artists attending the fellowship with us - Eliza Wheeler and Rashin Kheiriyeh - who we became good friends with. KLF: The text and illustrations work amazingly well together. I love how the book flows from a young boy in play to this incredibly imaginative story and returns to the young boy and his mother, all the while, there is this nod to the grandfather and his stories. How did you decide on the direction and flow for the story? Terry: Thank you! It took us quite a while to find the story, and the text went through a number of different drafts. Much like The Night Gardener, the initial spark for the story started with a stand-alone image from many years ago. It was an image of a whale in the clouds surrounded by sailing ships. We knew we wanted to have our character Finn visit this magical place, but we also wanted to deepen the story and give it some resonance beyond just the adventure aspect. Early on we decided to make the character of Finn Asian, which got us thinking about our own family. Our grandfather and father were both storytellers, and the stories we were told as children had a big impact on us and likely steered us into wanting to tell our own stories as adults. We started seeing the “story” as a kind of seed planted that can grow in the mind of the person hearing it. Eric: We also saw kids reacting to The Night Gardener - inventing their own topiaries, even filming little movies based on our book - and we knew it was a theme we wanted to explore. 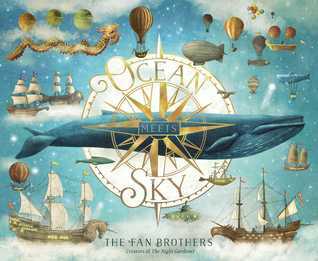 So in some ways, even though the reader experiences Ocean Meets Sky from Finn’s perspective, for us as writers we’re more aligned to the grandfather’s perspective, with Finn being a proxy for the reader entering the imaginative world of the book. Like Finn, the hope is that a story can grow in the mind of the reader and act as inspiration, or grow into something entirely new. Since the book is also about loss, and coming to terms with loss, we wanted to show how a story could become a form of connection and closure; we build our life using stories, structure our memories and feelings into stories to make sense out of them. We liked the idea of Finn living through his grandfather’s story, and by breathing new life into it he’s kept his grandfather’s spirit alive inside him. KLF: When you think of your journey as artists, who do you credit as influencing your work and did you see your career going in the direction of creating children's picture books? Terry: I think the biggest early influence on us was our parents. Our father loved to invent stories and would create magically little story-worlds for us to participate in. His stories usually had messages in them about tolerance or conflict resolution, and he would ask us to think our way out of various predicaments presented to the characters. Our mom has always been our biggest artistic champion. She’s perhaps the one person who’s believed in us throughout our entire lives, even when we weren’t working directly in the art field. Before we could even read or write she helped us collaborate on our first book together “Many Years Ago” which was about dinosaurs. She stapled it together for us and wrote out the text as we dictated it. Somehow we still have the book after all these years, and through many moves. Eric: As far as our journey into picture books, Terry and I both attended OCAD together, but up until relatively recently we both had full time jobs outside of the art field. Children’s books were always something I was interested in, and when I was younger I submitted a manuscript I had written and illustrated with my younger brother Devin. We sent it out unsolicited, and unsurprisingly most came back unopened, but we did get two lovely letters of encouragement from a couple of editors. Fast forward to many years later, when the internet started to change the landscape for artists. It’s now possible to have your work seen by a global market by showing it on social media, or uploading it to sites like Society6, Threadless, and Redbubble. Terry and I both started selling our art online and by chance it caught the attention of our agent Kirsten Hall. That lead directly to our first book being published, The Night Gardener. Even in retrospect it all feels a little unreal, and we feel so fortunate to have “fallen” into picture books through remarkable good fortune and happenstance. KLF: Can you share about any future projects that you are working on? The Fan Brothers: We’re currently illustrating a lovely story called The Scarecrow, by Beth Ferry (HarperCollins) and after that we’ll be working on our third book, with a third Fan - our younger brother Devin! It’s called The Barnabus Project and will be published by Tundra Books/Penguin Random House in 2020. Look for a copy of Ocean Meets Sky at your local indie bookstore or public library. Terry Fan received his formal art training at Ontario College of Art and Design in Toronto, Canada. His work is a blend of traditional and contemporary techniques, using ink or graphite mixed with digital. He spends his days (and nights) creating magical paintings, portraits, and prints. The Night Gardener is his first book. Born in Illinois, he now lives in Toronto. Visit him online at Krop.com/TerryFFan and Society6.com/igo2cairo and on Facebook (Terry Fan Illustration). Eric Fan is an artist and writer who lives in Toronto, Canada. Born in Hawaii and raised in Toronto, he attended the Ontario College of Art and Design, where he studied illustration, sculpture, and film. He has a passion for vintage bikes, clockwork contraptions, and impossible dreams. The Night Gardener is his first children’s book. See more of his work at Society6.com/opifan64 and on Facebook (Eric Fan Illustration).